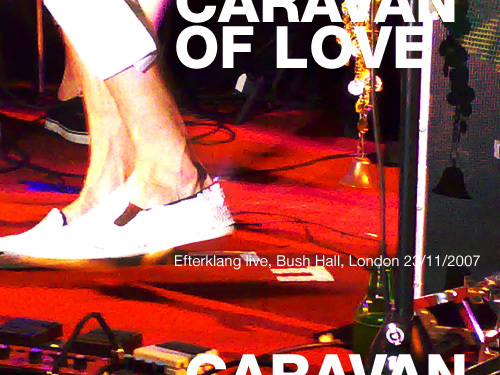 The Efterklang caravan stopped in London’s Bush Hall on Friday, as part of their two-week-long tour of the UK. Taking their Parades album, released a couple of months ago, on an extensive international tour, the Danish quintet and their troops couldn’t have chosen a more appropriate venue. Formerly known as the Carlton Dance Hall, Bush Hall, in the heart of West London’s Sheppard’s Bush, was built at the beginning of the twentieth Century by William F. Hurndall, a publisher, as a gift for one of his daughters. It has since been a soup kitchen during the Second World War, and was, in the fifties and sixties, turned into a bingo hall and amusement arcade, before being turned into a concert venue at the turn of the millennium. The highly ornate ceilings and walls have been preserved, and grand chandeliers offer a testament to the place’s former grandeur. Prior to the band going on stage, Denis Jones (whose performance was missed by this reviewer), and multi-instrumentist Peter Broderick were in charge of the warm up sessions. The latter delivered a blinding solo performance and managed to practically steal the evening. Hailing from Portland, Oregon, Broderick plays a wide range of instruments, including, but not restricted to, piano, violin, guitar, musical saw and drums, and also sings. His performance began with a series of violin swathes, played and recorded, then looped while he added more layers, before switching to the piano and continue building up his wonderfully evocative pieces. Melancholic, yet inspiring, Broderick’s music had a rather busy Bush Hall in awe. His dexterity at developing pieces out of nothing, building them into full entities, captivated and engaged his audience intensely. Toward the end of his set, he gave an interpretation of a song taken from the soundtrack of a Swedish movie. Having built up vocal harmonies and layers of accompaniment on the piano, he invited the entire live formation of Efterklang on stage to join in with the singing, and promptly got the audience engaged too. Broderick has just released his first single on Type, with an album to follow in the new year. If this live performance and the tour CD which sold out in minutes at end, are anything to go by, he is one of the talents to watch in 2008. Following a short break, Efterklang and friends took over the stage, all, apart from pianist Anna Brønsted, wearing black shirts and breeches. The usual formation of Mads Brauer, Casper Clausen, Thomas Husmer, Rune Mølgaard and Rasmus Solberg was augmented with trombonist Niklas Antonson, Anna Brønsted and Broderick on violin and, toward the end of the show, drums. Kicking off with a testosterone-fuelled Polygyne, which had singer Clausen frantically tormenting a set of drums while organised chaos was taking shape being him, the Efterklang machine was soon speeding ahead at full steam, barely stopping to catch their breath between songs. Reading through the majority of Parades, from the highs of Mirador, Horseback Tenors and Caravan to the elegant simplicity of Him Poe Poe and Cutting Ice To Snow, and injecting an ounce of Under Giant Trees (Himmelbjerget) before turning their attention to a few old pieces, the formation delivered a very enthusiastic and energetic set. Stripped down from their orchestral sheen, the Parades songs were seemingly rougher and edgier, with Solberg and Brauer left to fill in the gaps with added guitar and electronic textures, and Clausen to superimpose drums and percussions. Mirador and Horseback Tenors in particular were delivered with an urgency that had very little echo in the band’s discography. This certainly didn’t work against the band though, and a Bush Hall filled to the brim showed its appreciation. Older compositions, amongst which Swarming stood out undeniably, provided the band with an opportunity to give the electronic textures, clicks and static crackles that characterised their early work an airing and remind the audience of the journey covered in by the band in the last three years. By the time they came back for an encore, delivering a heart-warming Chapter 6, Efterklang had once again Bush Hall singing its heart out, leaving the audience enchanted and inviting them to say hello in the foyer after the performance. Efterklang have, with Under Giant Trees and Parades, delivered two of the most fascinating and compulsive record this year, but the supreme complexity of the latter could have proved rather difficult to transfer to the stage. As it stands, Efterklang have managed to do this rather well, and if the performance felt at time slightly chaotic, it is surely because, after spending much time working on finely tuning their studio pieces, Efterklang are now indulging in much deserved spontaneity, and put it to rather excellent use. I’d just been wondering about the history of Bush Hall. Most interesting. I think soup should continue to be served, and a few games of bingo between acts wouldn’t go amiss either. Now, soup and music, that sounds like something different. Not sure about the bingo thing though… went to bingo once in my life, and it’s left me traumatised to this day! Nice review here, that had me reflecting on Efterklang’s Glasgow performance. They were wonderful here too, Casper Clausen was a thoroughly engaging frontman, reminding me of Van Der Graaf Generator’s Pete Hamill. I was also wondering how ‘Parades’ would transfer onto a live setting — but within the opening strains of ‘Mirador’, I just knew it was going to be a special evening.